Please welcome Jay Hosking to The Qwillery as part of the 2017 Debut Author Challenge interviews! 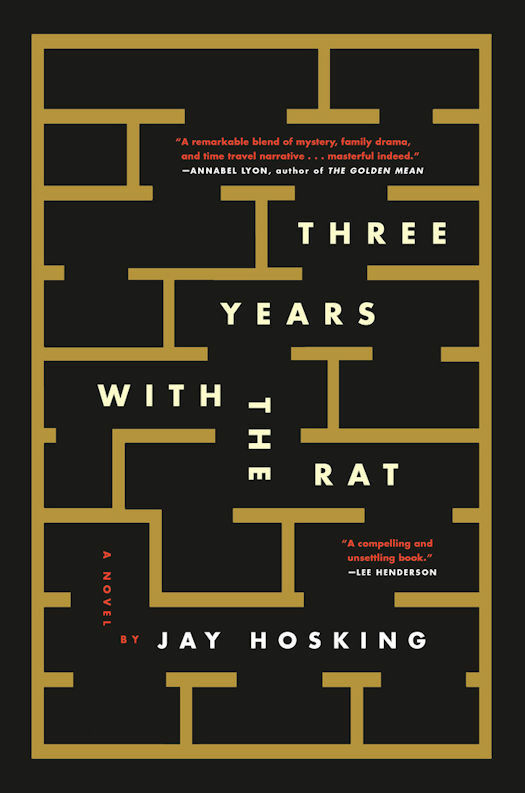 Three Years with the Rat is published on January 24th by Thomas Dunne Books. Please join The Qwillery in wishing Jay a Happy Publication Day! Jay: Thanks for having me! I started writing in 2011, when I was working toward my PhD in neuroscience. Being in the lab all the time was making me into a crazy person. I had always been a voracious reader of fiction, and always wanted to write, so I snuck into a writing workshop at my university. Jay: Both, but not at the same time. The Rat book has three years playing out at the same time, and thus required that the timeline was consistent and easy to understand, so plotting in advance was important. I had a spreadsheet that detailed what had to happen in each chapter of each year. The new book I'm working on, however, requires a lot more "pantsing". Jay: Finding the time to do it. Jay: Hoo boy. Just about everything! Other fiction, cities, nature, friends, loved ones, minutiae (like a scrap of paper on the ground) that get my mind spinning. TQ: Describe Three Years with the Rat in 140 characters or less. Jay: A young man's sister and friend go missing. The only clues: a box made of mirrors and a note that says, "This is the only way back for us." TQ: Tell us something about Three Years with the Rat that is not found in the book description. Jay: The Rat book is about what happens when the known brushes up against the unknown. TQ: What inspired you to write Three Years with the Rat? How did your background in neuroscience influence the novel? Jay: I'm not sure what inspired me to write the Rat book. It started with the image of the box: wooden, big enough to fit a person but too small to stand up, covered with mirrors inside, reflections upon reflections to infinity. I thought about why someone would build that box, and I was sure it was a gift to someone lost, and a tool. And then the story unspooled from there. As for my background in neuroscience, I'm not sure it directly influenced the novel. If anything, the Rat book deals with why we seek knowledge, the better and worse reasons to do science, rather than the science itself. The book was informed by the motivations of scientists and other knowledge-seekers, with a smattering of details from the lab/research life to add verisimilitude. Psychophysics (the field of science described in the book) certainly exists, but doesn't really resemble what I've written at all. TQ: What sort of research did you do for Three Years with the Rat? Jay: I kept three books on my desk as I wrote the Rat book: Flatland by E. A. Abbott, Nothing: A Very Short Introduction by Frank Close, and The Myth of Sisyphus by Albert Camus. Living in a multi-dimensional universe, defining nebulous concepts, and finding meaning in a purposeless existence: these were my research. 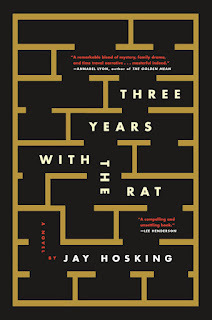 TQ: Please tell us about Three Years with the Rat's cover? Jay: The cover is by C.S. Richardson, a Canadian gent who has made countless fantastic dust jackets (I'm fond of his cover for Sam Wiebe's Invisible Dead, how it works in different ways at different distances). One thing I like about the Rat book's cover is that it isn't too on the nose and doesn't depict anything from the novel. But its motif—the labyrinth—is a great metaphor for the journey of the main character in the book. Plus, lab rats and mazes, right? TQ: In Three Years with the Rat who was the easiest character to write and why? The hardest and why? Jay: Buddy the rat was definitely the easiest character to write. I feel for that little guy. Hardest character to write was probably the narrator, who I wanted to play his cards pretty close to his chest (a la Raymond Chandler's Marlowe) but also be strongly emotionally invested in the journey. TQ: Why have you chosen to include or not chosen to include social issues in Three Years with the Rat? Jay: The social issues in my book are relatively subtle, and they are included because they are a part of life. We all know people who have struggled, and to not include these struggles when they are so common would be willfully distorting reality for the purposes of personal bias. Put another way, writing an apolitical book is a political act. But like I said, the issues are not the story, and not particularly featured in the book. TQ: Which question about Three Years with the Rat do you wish someone would ask? Ask it and answer it! Jay: Great question! And because I've never been asked it, I've never thought about it. Let me think now... hmm. TQ: Give us one or two of your favorite non-spoilery quotes from Three Years with the Rat. "I can collect all the data in the universe, but at some point I won't be able to comprehend how all the parts form a whole. My brain, my biology, limits my ability to understand... There are just some things that are outside of comprehension, even if we can quantify them. At some point, science becomes magic." Jay: I'm currently finishing up another novel, tentatively called "Chimera", and publishing short stories in a few literary magazines; feel free to check out some of my short fiction here and here! Jay: Thank you so much! It was really fun to be included. Please go read Three Years with the Rat!